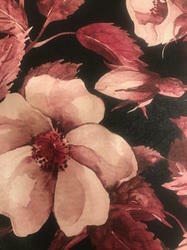 Om Enterprises offers a wide array of Interlining fabric for its customers. Interlining Fabric is a soft, but thick fabric which is inserted between the dress fabric and the back lining. Interlining fabric helps the main fabric to drape gracefully. It improves the shape retention quality of the fabric. 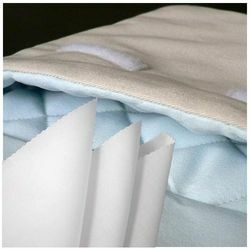 It gives strength and the padded fabric gives warmth or bulk to the fabric. There are different types of interlining fabric like woven, knitted and non-woven. Many of our clients use our interlining fabrics for making different types of thick, sturdy, smart coats and suits. Om Enterprises supplies Woven fusible interlining fabric, it is created by the interlacing of warp and weft fibers in a regular pattern. There are different types of weave style. 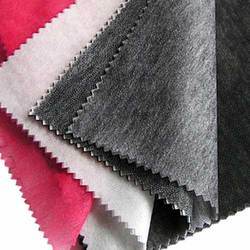 We offer a range of woven fusible interlining fabrics in various colours and specifications. With high bonding strength and controlled shrinkage, these are highly durable fabrics with a long serving life. Our woven fusible interlining fabrics are suitable for water-washing and dry washing. 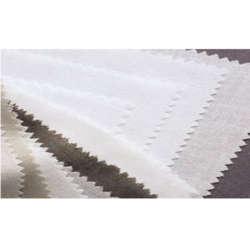 Our extensive array of non woven and woven fusible and non fusible interlining is manufactured from quality raw material and is available in various colors as per the client’s specifications. With high bonding strength and controlled shrinkage these fusible and non fusible interlining are highly durable fabrics with a long serving life. These fusible and non fusible interlining are used for retaining the softness of fabrics and shapes of garments. Our interlinings include fused, basic, geo fabric, and many more. We offer a wide range of linning cloth which is made from high quality raw material serving various purposes of textiles as well as individual needs. We can manufacture as per quality standards and also customize as per requirements of the clients. Looking for Interlining Fabric ?